Back in August 2015, I wrote a blog post about the sleazy auto-warranty companies mailing me trying to get me to sign up after I’d bought out the lease on my wife’s car. It’s turned into one of the more popular posts on this site, so, without further ado: it’s time for another sleaze! A couple of weeks ago, I closed on a new house for us: bigger plot and house, with a garage for a third car (hello, 64SAINT! ), and air conditioning. We’re certainly happy about it and are going to be moving in a couple of weeks after a few tweaks have been done to this and that. Anyway, this post isn’t about that, but about a certain class of sleazy companies that have crawled out of the woodwork mailing me to try and get me to get their particular brand of … Mortgage Protection! Yes, take a good look at that scan. It’s in three parts: the return envelope, the setup, and the form to be filled in. 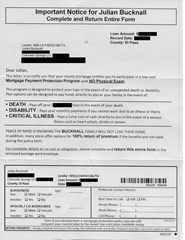 Notice in particular that the way it’s printed seems to indicate that it’s from Wells Fargo, the bank that provided the mortgage for me. 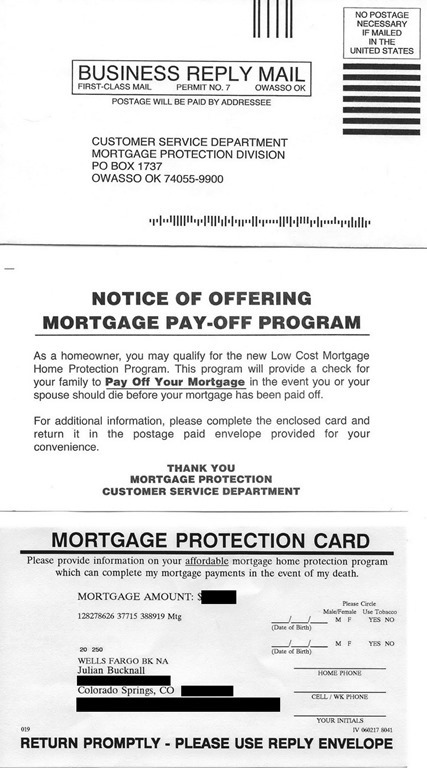 There is no other company name at all (unless it’s Mortgage Protection or some such), no bit of text in 6pt warning me that they are not affiliated with Wells Fargo (and the reverse sides of these pieces are blank). They’ve merely scraped this info from some public repository, and sent me this exhortation to PROTECT my MORTGAGE. Talk about a protection racket. 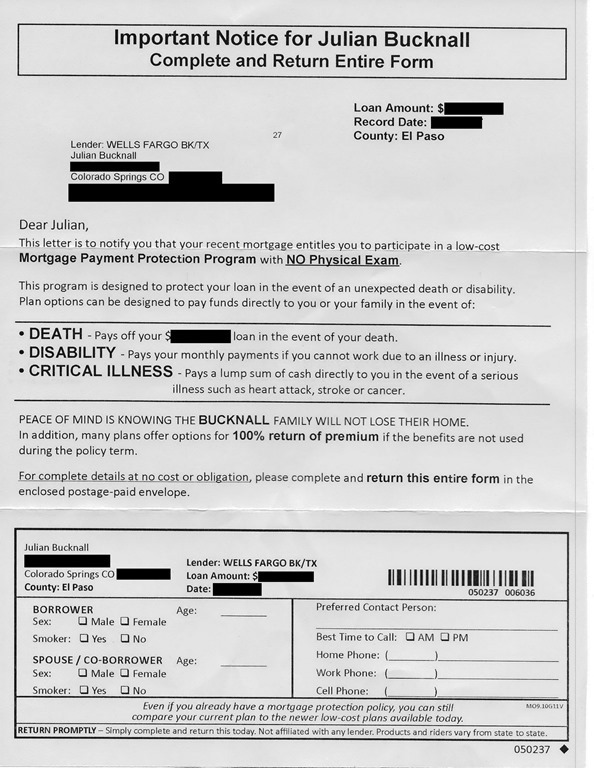 Of course, the best way of doing this is to get a life insurance policy that covers the mortgage amount, which is what I’ve done for many a year. Plenty of reputable insurance companies around, and the premiums are lower because it’s a competitive market. The owners of these companies are either a holes who grew up fvking their wh0re mothers or b1ttches who grew up getting fvked by their dads. These m0therfking aholes and fatherfvking wh00res need to be exposed. They're still at it. Do you still get this mail?